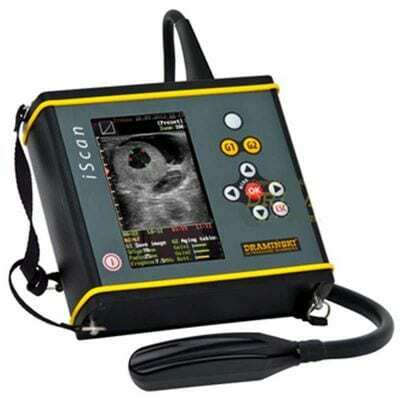 Draminski iScan for field veterinarians – Ultra light, ultra mobile, ultrasound scanner iScan. The iScan is designed primarily for field veterinarians & specialists dealing with day-to-day cattle PDs and fertility. iScan comes with a linear rectal probe fixed permanently to the device. It is designed to be used mainly on the reproductive tracts of cows and mares, but it can also be used to examine horses’ tendons and eyes. It is ultra-light at just 2 kg. It is ultra-small with a 5” LED screen. Its dimensions are 17 x 17 x 6 cm. The battery life is 5 hours when fully charged, spare batteries take 2 hours to charge. iScan gives the clinician a diagnostic image of the reproductive tract of cows and mares, eyes and tendons of horses and udder pathology in milking cows. The LCD screen is backlit, and a sun protective shield allows you to see a clear image on the screen even in direct sunlight. A dirty device is not a problem, even the dirtiest of scanners can be cleaned easily without causing any damage. Use a USB to transmit the images and cine loops to your computer. After extensive research and development, the new iScan goggles are now available.